Com-til compost, leaf compost, topsoil, and many other! The Triple processed black hardwood is by far the most popular-it is dyed a dark color with food grade colorant to maintain a dark look longer. Regular hardwood comes brown, and fades to a silver/gray over time. Most products perform equally at protecting plant roots from extreme temperature and moisture conditions. 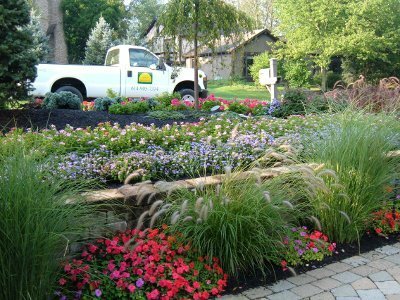 The time of year to refesh existing mulch is a matter of opinion-we usually start in March and mulch through June, but anytime late summer or fall works as well.